We’d love your help. Let us know what’s wrong with this preview of Doctor Who by Jonathan Morris. Millions of years ago, the noble Ice Warriors fled to Deimos, moon of Mars, hoping to sit out the radioactive death throes of their home planet. When the TARDIS lands on Deimos, the Doctor discovers that the Warriors' ancient catacombs are now a popular stop for space tourists. But the Martian dynasties are more than history, and the Warriors are far from extinct. It's not Millions of years ago, the noble Ice Warriors fled to Deimos, moon of Mars, hoping to sit out the radioactive death throes of their home planet. When the TARDIS lands on Deimos, the Doctor discovers that the Warriors' ancient catacombs are now a popular stop for space tourists. A Martian moon has become a tourist trap, but below its surface stirs a deadly menace. On the Martian moon Deimos, the Ice Warriors sealed themselves away while their planet was rendered inhospitable. By the 23rd Century, they were believed to be extinct and Mars and its moons became popular tourist destinations for humans. But now the Ice Warriors are awake. And they want Mars back. Listened to this on a road trip. 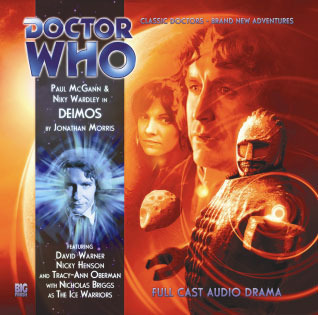 It's been a while since I've listened to these, and couldn't quite remember where I was in the grand scheme of the story, but it was nice to have the Ice Warriors back and Paul McGann was brilliant as always. Nice little twist as well. This is the first part of a two-part story. As usual, I have reviewed both parts together here. Set on the titular moon of Mars, as its cover makes clear this is an Ice Warrior story. The Martians here are rather more ruthless than they have been in most other stories since the 2nd Doctor era, showing their general versatility. But the story is much more an examination of the 8th Doctor himself, pushing his philosophy to the fore and forcing him to face up to some of the less palatable consequenc This is the first part of a two-part story. As usual, I have reviewed both parts together here. Set on the titular moon of Mars, as its cover makes clear this is an Ice Warrior story. The Martians here are rather more ruthless than they have been in most other stories since the 2nd Doctor era, showing their general versatility. But the story is much more an examination of the 8th Doctor himself, pushing his philosophy to the fore and forcing him to face up to some of the less palatable consequences of his decisions. Tamsin also finally starts to come into her own here, providing a clear counterpoint to the Doctor's views, and it's handled well enough that one can reasonably debate which of them is really in the right. Certainly, one can see why she's tempted when one of the villains tries to turn her against the Doctor - something that simply wasn't so well done in the recent 7th Doctor story Project: Destiny. In addition to this, we have a high quality cast portraying a broad array of characters, all caught up in the unexpected return of the Ice Warriors. The two-part format benefits things here, and it doesn't feel overly extended as some other similarly long 8th Doctor stories have done. For example, I liked the holidaying couple, who brought a dash of humanity to the proceedings despite not being central to many of the events. And, of course, there's a major twist in the ongoing season story arc, leading us into the next episode and fitting a lot of what has happened so far together. Tamsin Drew und der Doktor sind diesmal irgendwann in der Zukunft unterwegs. Es geht zum Sightseeing in ein Museum auf dem Marsmond Deimos das den noblen Eiskriegern gewidmet ist, die sich in Höhlen zurückzogen, um den Untergang ihres Planeten in Stasis auszusitzen. Dumm nur, dass die Experten auf dem Gebiet der Eiskrieger, das nicht mitbekommen haben und zudem so einige Inschriften nicht ganz korrekt übersetzt haben. Als die Eiskrieger dann ganz unerwartet erwachen und das Museum übernehmen, is Tamsin Drew und der Doktor sind diesmal irgendwann in der Zukunft unterwegs. Es geht zum Sightseeing in ein Museum auf dem Marsmond Deimos das den noblen Eiskriegern gewidmet ist, die sich in Höhlen zurückzogen, um den Untergang ihres Planeten in Stasis auszusitzen. Dumm nur, dass die Experten auf dem Gebiet der Eiskrieger, das nicht mitbekommen haben und zudem so einige Inschriften nicht ganz korrekt übersetzt haben. Als die Eiskrieger dann ganz unerwartet erwachen und das Museum übernehmen, ist der Experte auf dem Gebiet der Eiskrieger plötzlich mit einer eher unerwarteten Realität konfrontiert und muss einige seiner Veröffentlichungen wohl noch einmal überdenken. Sehr witzig, diese Kritik an den Historikern, die glauben, anhand von Inschriften auf ein Volk schließen zu können, vor allem anhand von Inschriften, deren Schrift und Sprache sie selber erst einmal rekonstruieren mussten. Wie würden heutige Historiker wohl in so einer Situation reagieren? Eine Diskussion mit den Forschungsobjekten anfangen, dass sie sich falsch verhalten würden, schließlich wäre man ja Experte auf ihrem Gebiet? Diese Episode endet mit einem Cliffhanger und geht nahtlos in der nächsten Folge „The Resurrection Of Mars“ weiter. On a frozen moon of dead Mars archaeologists find more than just the relics of the Ice Warriors. The quality of all the Eighth Doctor stories from Big Finish has been universally and consistently high. Although this was not my absolute favourite story in this series it is still a great piece of audio drama featuring a classic enemy. I enjoyed the pace and feeling of tension in this story. Plus Ice Warriors rock. An excellent cast give a great performance with a wonderful script. I did quite enjoy this story. It was nice to have Ice Warriors and David Warner in the same audio. It was nice to have a more serious adventure and a bigger plot. The ice warriors were quite threatening and spooky, (though my favourite use of them being Peladon it was a bit sad that they were simply the bad guys and there wasn't anything more mixed up about them). I'm afraid Tamsin still remains a rather dull companion. Great 1st part of 2 parter and a fantastic tie in for the entire series. Eight and Tamsin encounter Ice Warriors. Cliffhanger ending with a message from an old friend. Jonathan Morris is a prolific writer of Doctor Who fiction. He has contributed to many ranges, in every medium except television. His style has often been compared to that of Douglas Adams, perhaps in part because he dedicated The Tomorrow Windows to Adams. Indeed, this dedication was discussed at length in at least one prominent interview about the book, in which the interviewer's questions and M Jonathan Morris is a prolific writer of Doctor Who fiction. He has contributed to many ranges, in every medium except television. His style has often been compared to that of Douglas Adams, perhaps in part because he dedicated The Tomorrow Windows to Adams. Indeed, this dedication was discussed at length in at least one prominent interview about the book, in which the interviewer's questions and Morris' answers left readers with the impression that the book was in fact "set in the Douglas Adams universe"